Fantasy author Jim C. Hines took a break from working on his new series to do one of his famous here’s the ridiculous sexist poses they put women figures in on SFF covers for no reason cover poses. Although Jim has mainly retired from doing such photo shoots, in order to save his back, he came out of retirement for a good cause — to raise money for the Pixel Project, which works to end violence against women. 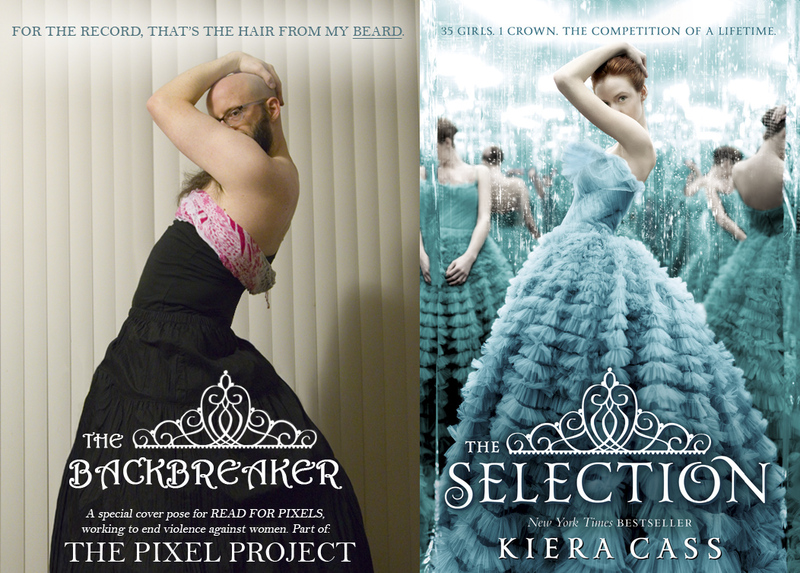 A donor paid $500 and they selected imitating the cover for the YA novel The Selection by Kiera Cass. Here’s the photo here, and you can check out Jim’s blog for info about donating to the Pixel Project. Hopefully his spine remained intact! Back in 2013, I did a blog post about women SFF authors, “Reality and the Welcome Sign — Gender and SFFH,” in reference to Tor UK’s editorial director Julie Crisp’s blog post at the time about how Tor welcomed women authors but they weren’t showing up in submissions, or at least not for things like hard SF. I felt that Crisp was offering a nice welcome message but missing the plot of what women authors actually faced in the field regarding discrimination and marketing obstacles to their success from the industry. Essentially, Crisp was using the “it’s women’s fault that we’re ignoring them” defense, a very popular idea, and the stats that she compiled on Tor UK’s submissions have often been cited by those who want to claim women SFF authors face no discrimination in the market at all. Unfortunately, the stats Crisp offered show the exact opposite. I was contacted about whether a quote from that blog post could be used in an up-coming non-fiction work on the SF field and I said sure. That book, an academic reference work on early women SFF writers, came out this year from Wesleyan University Press. It’s called Sisters of Tomorrow: The First Women of Science Fiction, edited by Lisa Yaszek and Patrick B. Sharp. It offers sample works of prominent women writing SF in the early twentieth century, along with lots of commentary and historical context of the field in its early golden age and the women’s role within it. My quote is in the concluding essay written by author Kathleen Ann Goonan, which looks at the women in SF and the science community and the contemporary SF field in contrast. Being an academic work meant for universities, it’s a bit on the pricey side though chock full of good stuff. If you are looking for a good specialized reference book or teaching writing fiction or SFF fiction, it might be helpful. Anyway, I wish it well and not just because I got a shout out in it. As author Joanna Russ explained so clearly in her non-fiction book, How To Suppress Women’s Writing, if we don’t talk about women writers, society will pretend they aren’t there. Especially these days.